It's no secret that Google has been taking steady steps toward supporting dark mode in most of its Android apps. Over the past year, we've seen YouTube, Phone, Contacts, Messages, the Pixel Launcher, Google News, some parts of the Maps app, and more get a darker, less retina-searing, more battery-friendly theme. After hoping that Android Pie would bring a system-wide dark mode, then being disappointed that it didn't, everyone was cautiously optimistic that Q would finally be "it." We were, maybe, 90% sure, but didn't want to get our hopes up. Now, we have more reason to dream, so let's say we can raise it to 95% sure. 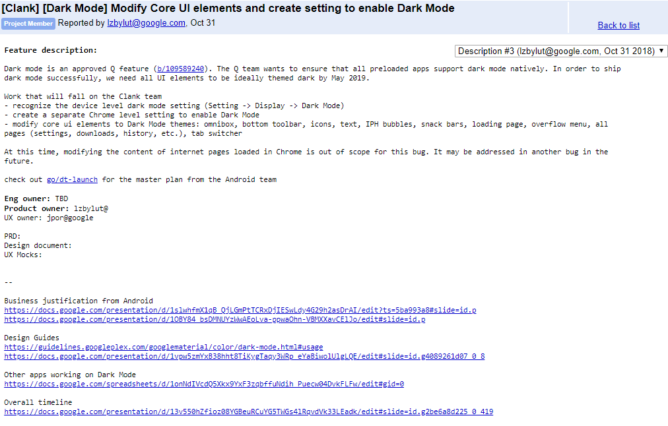 There are several links to internal Google documents that we can't access, but it all shows that this dark mode is a serious undertaking at Android HQ. 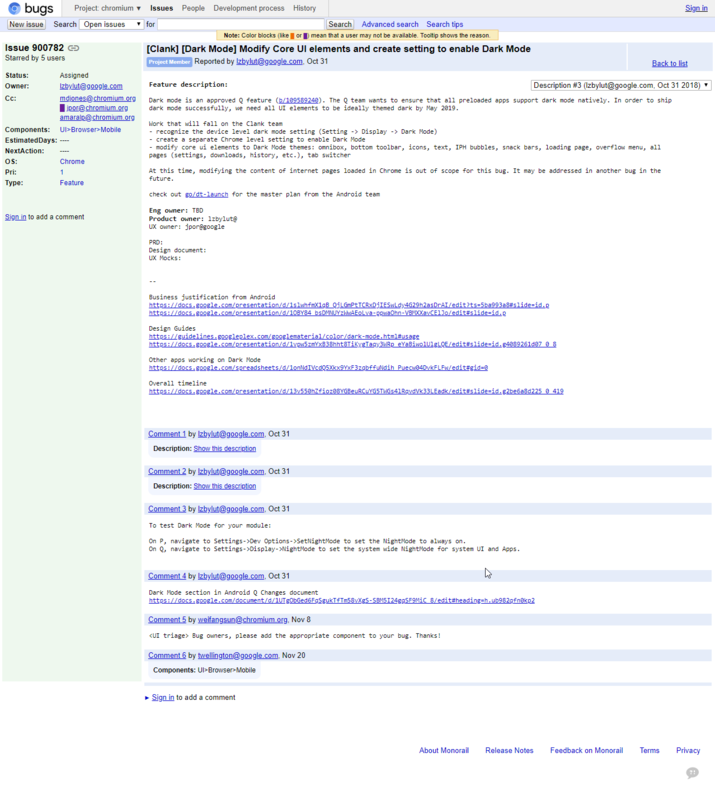 And finally, there's a small mention that working on modifying content loaded in Chrome (read: darkening the webpages you browse) is not part of this project, but it may be looked at later. Now the only caveat here is that this Chromium issue dates back to October 31 and not much has visibly happened on it since. Plans might have changed. Google could always alter its timeline if it sees that not all apps would be ready for a dark mode. We might see the system-wide dark setting from the first developer preview early in the year, or could wait until the public release of Q later to have it. We may also wait longer if plans change. But what is sure is that itshappening.gif; if not now, then soon. Google has changed the permissions for the thread on the Chromium Bug Tracker, making it inaccessible to us non-Googler plebs. All this secrecy certainly implies the dark mode expectation is legit. 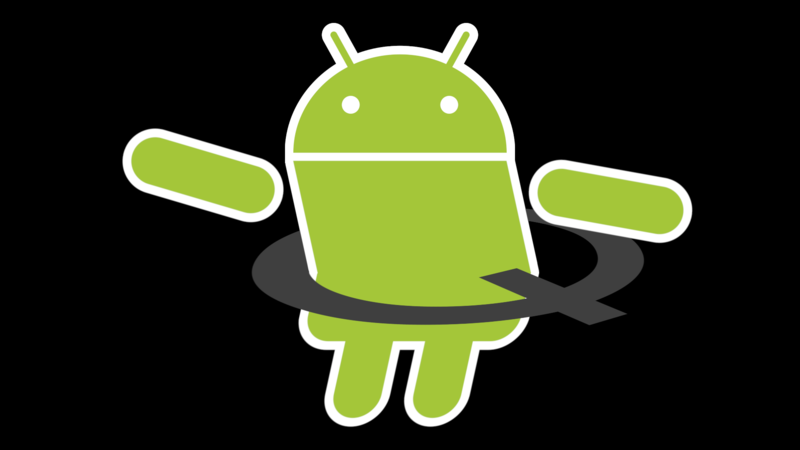 Awesome hula hooping Android Q artsy credit: Our hero image hero, Ryne Hager.